Exploring Swiss Alps, Schynige Platte is defiantly one of a must see places. Traveling to Schynige Platte was a romantic and nostalgic adventure. The narrow-gauge cogwheel railway, which goes up to Schynige Platte (1967 m), has been working since 1894. The historical trains are over 100 years old, and look exactly as they were a century ago. I felt like I’m travelling back in time in those charming old-fashioned carriages with wooden benches. The journey from Wilderswil to Schynige Platte took approximately an hour, but it didn’t feel so long as I was enjoying nostalgic atmosphere of the train and the fascinating view of the valleys. Schynige Platte is a mountain ridge with the altitude 2076 m a.s.I. Located in the Jungfrau region. 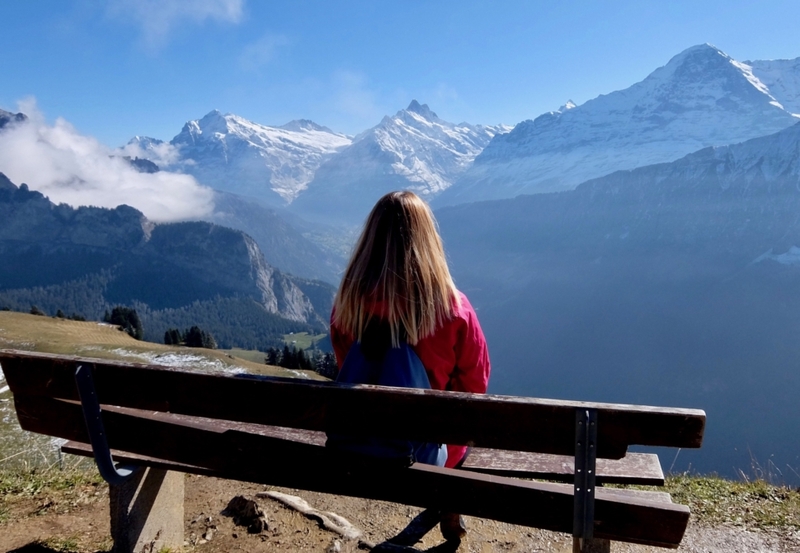 From Schynige Platte you will enjoy incredible panoramic view over the valleys of Grindelwald and Lauterbrunnen as well as the mountains Eiger, Mönch & Jungfrau. The mountain railway station is at 1967 metres a.s.l. Getting there from Zurich main train station: Zurich HB -> Bern -> Interlaken Ost -> Wilderswil -> cog railway to Schynige Platte. The journey from Zurich would take around three and a half hours. The cog railway operates from May until October. Tickets: price for the tickets may vary depends on the trains connections. The price for the round trip on the cog railway from Wilderswil to Schynige Platte is CHF 64.00. Half-fare cards and Day pass are valid. More details about tickets and trains you may find on the SBB website. You may also find more information about the region on the Jungfrau official website. Check the weather report before traveling. The best views, of course, when the weather is nice and sunny. There are a lot of nice hiking trails around. You would discover lovely music of alphorn players right above the railway station, as they play every day from 11:00 to 14:00. Make sure, you don’t miss it. If you are a nature lover, like I am, you would enjoy Schynige Platte Botanical Alpine Garden, with more than 600 species of plants from all over Switzerland. One more nice attraction at Schynige Platte is The Schynige Platte Nature Cinema. The huge wooden frames show the best quality move scenes – breathtaking natural landscape. In order to find the frames simply follow the circle hike that starts above the railway station and ends at the Mountain Hotel. If you want to explore the region longer and get unique Swiss-Alpine experience, you can stay at Schynige Platte Mountain Hotel. The hotel is located close to the railway stain and has exceptional view over the Alps. There is also a lovely restaurant with a traditional Swiss cuisine and a panoramic terrace. Enjoy you discoveries in the Swiss Alps. Check the links below for more mountain destinations, travel tips and photos. More useful information for travelling to different countries and cities you can always find on the TRAVELLING PAGE. What is your favourite mountain destination? You are welcome to share your experience in the comments below.